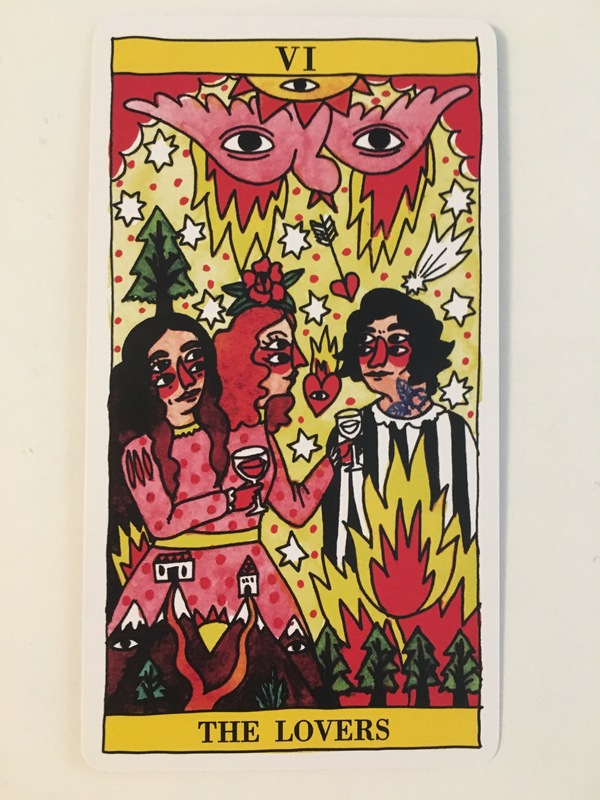 Card: VI The Lovers – from the Tarot Del Fuego by Ricardo Cavolo. 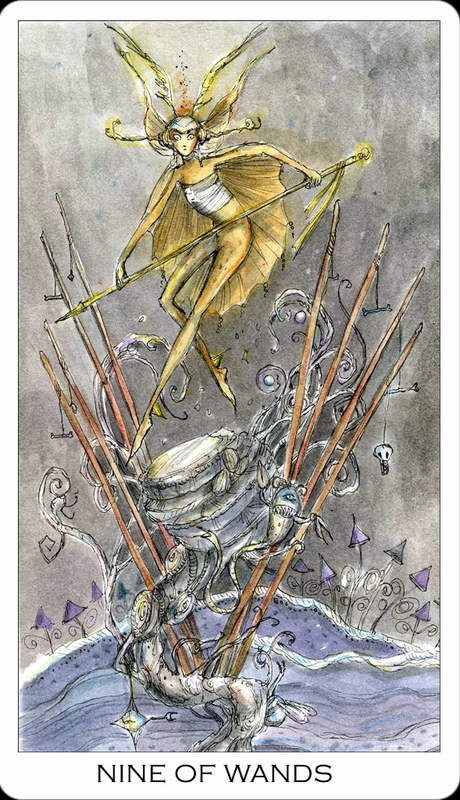 Message from the Faeries: This week, it’s all about love. For those of you who are single and are hoping to meet someone, and for those who are wanting romance in your life, this week will present you with an opportunity. If this is what you really want in your life right now, then pay close attention to signs being given to you and listen tonyour intuition. If you feel compelled to go somewhere or do something, then you should follow your instincts. We would like to take this time to tell you that you are all surrounded by love, all the time. If you are feeling a lack of love right now, then you are not paying attention to the love that is there for you at all times. It means you’ve closed yourself off to love that is always there. Open yourself up and be vulnerable. Let the love in. Please don’t forget this you are made of love. You don’t even have to look outside for love, all you could possibly need is within. Give yourself some love you deserved it. And this is our other message for this week – you all deserve love. Every single one of you. No exception. You all deserve to be have love. You all deserve to be loved. You all deserve to give love too. We hope you take this to heart. Hi Everyone! I have an Instagram account now. I will be posting the weekly readings there as well from now on, and I will also be posting extra content on to there. If you follow me on there I will follow you back. The link to my Instagram account can be found here. Or, look for @faeriemessenger. Looking forward to see you guys over there. I don’t know about the rest of you, but today has been a struggle. All day I felt like there was a darkness looming over me. I felt this overwhelming sadness and hopelessness. All this pain and fear I didn’t know I was carrying was weighing deep in my heart. I didn’t want to move or do anything. I just wanted to sit on my couch and feel sorry for myself. Eventually there was a small breakthrough and I forced myself to get off the couch and to go do laundry. I needed to move and I needed to clean. I learned that trick from an old friend. When you feel yourself covered in etheric grime, the best thing to do is to brush the dirt off your shoulder and clean! Laundry, change the bedding, do the dishes, sweep the floor, clean the bathroom. I had to change up the energy in my apartment and get my own energy flowing. I’m telling you, it really helps a lot. I start to notice the difference right away. So, I thought about it while I was doing laundry. 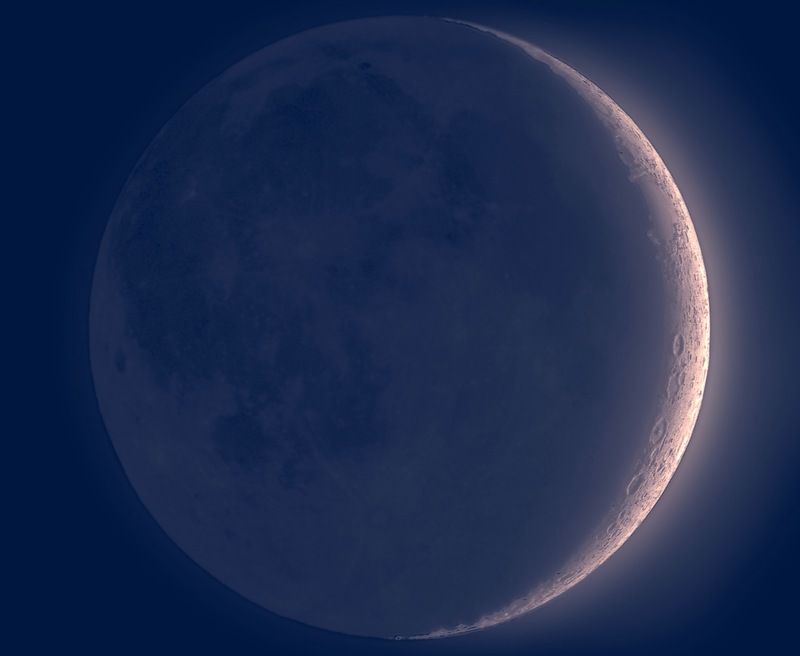 Tomorrow is the New Moon and it’s 11/11. It really makes sense that I’ve been feeling this way today. It’s my spirit letting me know that right now is time to let go of things that are not serving me. It’s time for me to do some writing. Writing down the bones. Getting those skeletons out of mental closet. I’m going to write a long letter to myself and burn it tonight. I’m also going to take a bath and cleanse myself. I’ll feel fresh when I enter my clean room and clean bed. I’ll also do a big smudge of my apartment tonight. I thought I would share in case any of you were feeling the same way. I don’t see why I need to be hanging on to some of these thoughts and feelings. I want to feel like I’m forward and not holding myself back. This seem a bit intense and crazy right now, but don’t lose hope. Things are going to work out in the end. I wish you all lots of love and healing on this wonderful New Moon. 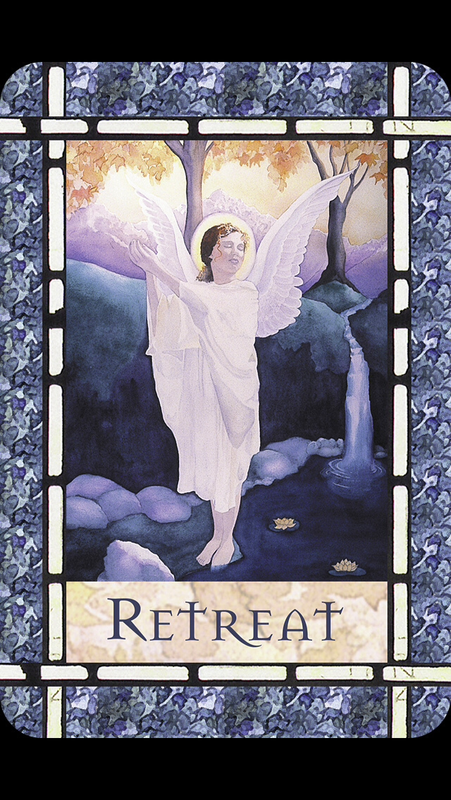 Card: Retreat – from Healing with the Angels by Doreen Virtue. “Are you pushing yourself too hard, beloved child of God? The Angels remind us that rest is a natural cycle in every living thing. Think of the mighty oak tree that grows in spurts and then rests. It draws its nourishment from deep within the earth, and takes its time before growing upward again. Like the oak tree, it’s important for you to nourish yourself with spiritual and emotional “food”. Message from the Faeries: It’s really important that you give yourself a break this week. Things have been a little bit whacky in the Universe these days, and we would like to tell you that this craziness is going to end this week, but it’s not. So instead of waiting for things to relax and calm down, we suggest you give yourself a time out from it all instead. If you can’t take a break from work or familial obligations, at least give yourself an hour or two of alone time. Go sit by the water or under a tree and just be quiet. Take a long hot bath and put a “Do not disturb” sign on the door. Meditate for 15 minutes every day. If you do at least on of these things for yourself this week, you spirit will give you many thanks and blessings. Some people have the mentality that taking a break or retreat from life is running away or avoiding things. This is not true. You aren’t running away, you are simply hitting the pause button. When you are in the depths of the chaos of life, your body, mind and spirit get so wrapped up in the drama. This takes a toll on you as a whole. Giving yourself a time out is like hitting the refresh button, so that you are able to come back to the craziness with a clarity that will help push you through. Don’t let the waves of chaos sweep you away. When you crash under a big wave: swim to shore, catch your breath, take a rest, then wax your board and get out there and try again. Soon you will grab that big wave and ride it out in bliss. 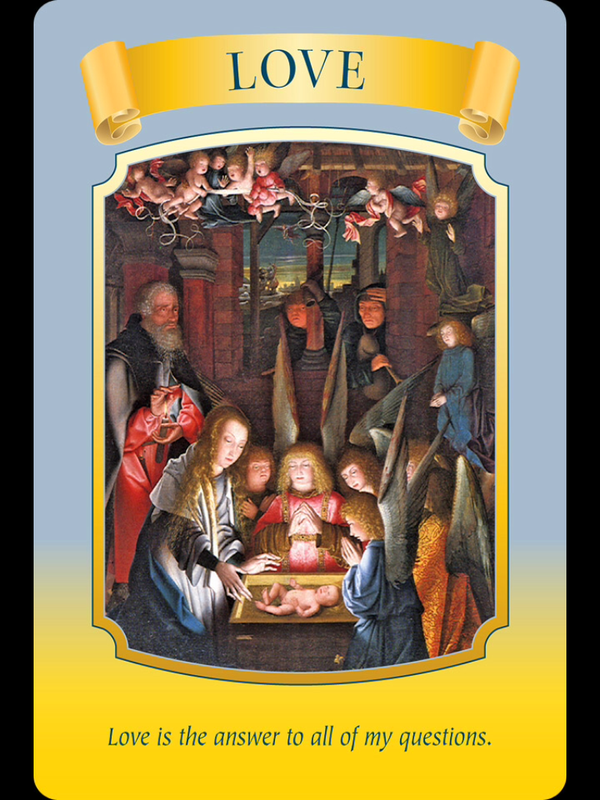 Card: Love – from the Mary Queen of Angels Oracle Cards by Doreen Virtue. Message from the Faeries: Love is the answer to everything. Love is the ultimate truth. Love is the key to solving all mysteries, removing all obstacles, and unlocking all metaphorical doors. Without Love there would be nothing. Love is the most purest and divine energy in the universe. In fact, Love really what makes the world go around. It is the energy behind all of life. Your very existence depends on Love. Despite this fact, you somehow trick yourselves into thinking that there is an absence of Love in your life. This creates a hole in your being that is impossible to fill, and yet the truth is that there is no hole, there is only Love. If you truly knew just how much Love is in and around you at all times, then you would have a need for nothing because you would know that you already had all that you ever needed. When you realize that you are full of Love and that Love is unlimited and eternal, you understand that you are whole. In the wholeness you are always knowing and trusting that you will have everything that you need in this life. Love connects you to the Divine. When you are connected to the Divine there is no fear. Without fear, you are in a place to be open and trusting that all your needs will be met and you are able receive all the abundance that life has to offer you. It is unlimited, just as Love is unlimited. When you are in a place of Love, you naturally have no desire to speak, think or write negatively, towards yourself or others. We wish you for you a week full of Love. May your hearts be open so that magic can come into your life. 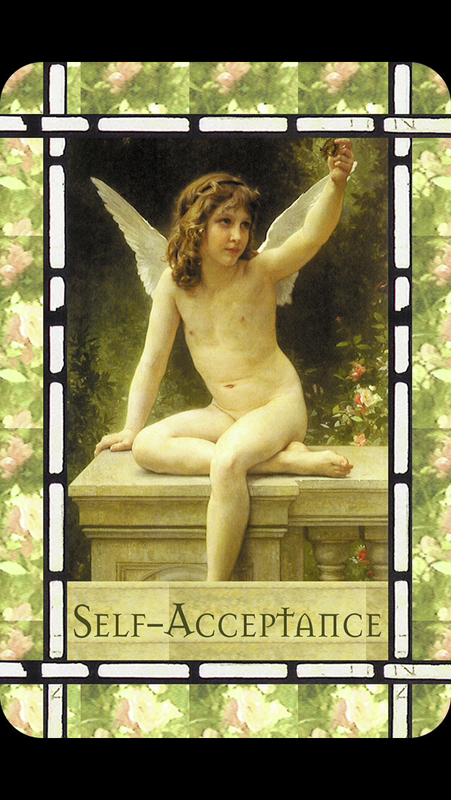 Card: Self-Acceptance – from the Healing with the Angels by Doreen Virtue. Message from Erin: Well, theFaeries say that it’s my turn to do the reading this week. What a wonderful card for all of us to get. It’s such a simple message, yet it might be one of the most challenging to hear: Love yourself – all of yourself. Love every single millimetre of your body. Love every inch of your soul. And love that ego of yours too! All of it! I hear all the time from the Faeries and the Angels that they love me no matter what I say or do. They tell me all that time that I am perfect in every possible way. They remind me all the time that because I am part of God’s creation, that there is absolutely nothing wrong with me. I hear these things, but I still have a hard time really listening and taking this powerful message to heart. I strongly believe that this one of the most important lesson in my life’s journey: learning to love myself. For me, it’s just not just about looking in the mirror and liking the person I see. It’s so much more profound than that. It’s about really learning to let go of all my judgments and hang ups. And oh boy, do I have a lot of them. Sometimes when I think I’ve got one taken care of, another one pops up out of nowhere. The human mind is quite the remarkable thing. My most recent example would be my recent decision to not become a professional tarot reader. For a while I thought it was I wanted to do. I’m really good at it. I know I am intuitively gifted and that I can really help people with my talents, but as I continued on my journey I realized that despite my gifts and talents, it’s not my calling. It isn’t my life’s purpose. I was really confused at first. I thought that because I have these gifts I was under some sort of moral obligation to share these gifts and talents. The Faeries have been showing me that I am under no moral obligation whatsoever! I am not really serving anyone if I am not perusing my true passion. I much prefer writing. I love writing, studying and academia. When I’m not pushing my brain’s limits I really begin to wilt, not blossom. This week I started to feel guilty because I’ve decided to go back to university. I feel incredibly excited at the prospect of going back to school to work towards a degree in sociology. I think I’m going to love it, but I had this funny moment where I was worried that going back to school would not be spiritual enough – even though the Angels and Faeries guided me to apply to university – I was worried it was too left-brained. So silly of me. I came to the realization that no matter what I am doing it’s being spiritual. It is called Universe-ity, after all. Acknowledging and remembering the academic side of me is part of my journey of self-acceptance. It’s been an interesting twist on the road of my life’s journey. I certainly wouldn’t have thought I would be headed this way a few months ago, but life unfolds in mysterious and magical ways. Whatever happens for all of you this week, I hope you remember to love yourself along the way.